Fired from a play and hired for the movie? 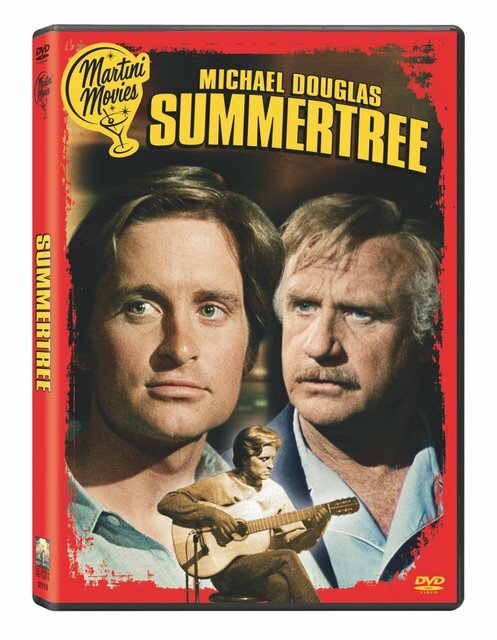 On the downside, as IMDb notes, Michael Douglas was fired from the theatrical production of Ron Cowen's play but on the upside, in the form of a gift, Michael's father Spartacus (aka Kirk Douglas) purchased the film rights for Summertree. 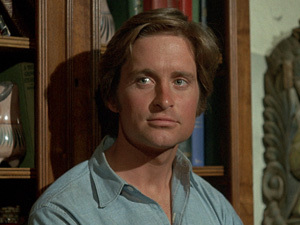 Not only reprising the role from which he had been let go, Michael Douglas pulled double duty for the Columbia Pictures '71 effort by producing the film alongside his father (as Sony's press release notes), most likely laying the groundwork for Michael Douglas to learn, evolve and become an Academy Award winning producer in his own right with One Flew Over the Cuckoo's Nest and The China Syndrome. 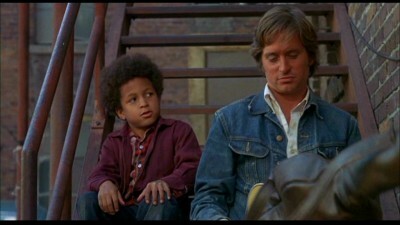 While it's clearly a message movie and the ending is about as subtle as a car being dropped from a skyscraper, admirably Summertree avoids the hippie protester trappings of other anti-Vietnam films of the era as a sort of square version of Milos Forman's Hair. 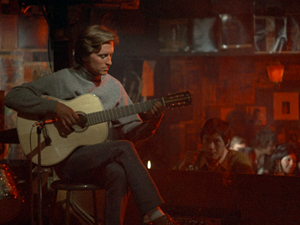 To explain, this one finds Douglas gently strumming his guitar as an aspiring musician instead of the showstopping numbers found in Hair by the man who would work for Douglas as director on Cuckoo's Nest. Well acted by a terrific ensemble including Barbara Bel Geddes (Vertigo) and Shampoo's Jack Warden as the parents of Jerry (Douglas), this low-key 89 minute movie directed by the actor and Oscar nominated Willy Wonka composer Anthony Newley takes a contrived yet more universally relatable and nonthreatening approach to the conflict. Instead of presenting us with the counterculture of the era head on as in another Sony Martini Movie-- The Pursuit of Happiness-- our protagonist Jerry is simply a handsome, average twenty year old American boy who is peculiarly struck with a sense of apathy, confusion, and unsure what he wants out of life or how he feels about anything. Disenchanted by his sociology major, Jerry decides to be proactive and try new things like joining the Big Brothers program where he looks after a tough, angry, distrusting kid named Marvis (Kirk Calloway) which leads to his encounter with Brenda Vaccaro's local beautiful nurse, Vanetta. Slowly he begins to feel more at peace again with life as he falls harder for Vanetta and realizes that his true passion in life is music. 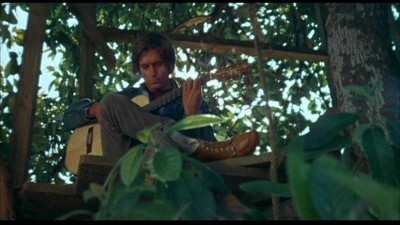 Connecting with the guitar and his two new friends, Jerry begins to seemingly resemble the boy we saw in the home movie sequence in the film's opening, smiling and content in the tree in his parent's backyard. Yet when he decides to try his luck at being accepted in the conservatory and fails to register for more courses in the hopes of transferring over, Uncle Sam hits him with a draft notice. While the film pulls out a few more surprises as things begin crashing down on Jerry left and right when he tries to speed up conservatory acceptance or figure out a way to flee to Canada, the movie quietly devastates us as well as Jerry when a few characters he trusts implicitly shock us with new revelations and actions. As it careens into an emotionally draining manipulation of an ending that-- to their credit-- the actors play to great effect even though a few emotional payoffs don't feel earned, we begin wishing that Cowen's play would've been reworked to make the final turn of events involving Vanetta and Jerry's parents more realistic. Perhaps by building up Jerry's character a bit more and giving us a better sense of why he was so disillusioned at the start of the movie which would've made his emotional rollercoaster jolt you to a greater effect as well as offering more insight into the rest of the ensemble, it wouldn't have felt like a rushed, less claustrophobic but still stationary filmed version of a play. 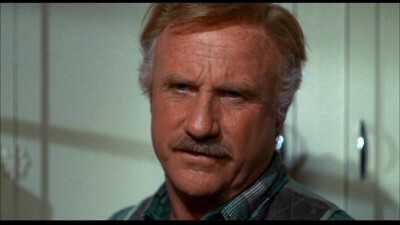 However, it's still a great find for devotees of Douglas to see the way he moved from earnest naive charm to the "Greed is Good" self-dubbed "Prince of Darkness roles" for which he's most famous. Yet, when you realize the quantity of films made about Vietnam from all angles in that era, you're left with the fact that the quality of this title doesn't come close to the ones that truly became a part of our culture like Coming Home, The Deer Hunter, and Apocalypse Now.